The area to be cleaned is first cleared of debris and larger weeds are removed by hand. Sealer application to protect your surface, this gives a semi matt finish. Oil stains treatment with chemicals to assist removal. Maintenance plans for regular upkeep of your rejuvenated surface. Weed killer application to reduce the regrowth. 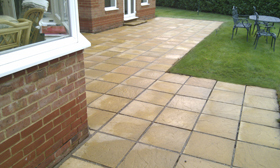 Re pointing service for patio slabs and walls. 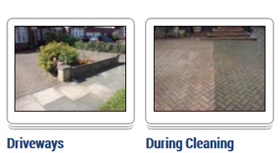 When cleaning block paving, a return visit may be necessary as the surface must be dry before re applying displaced jointing sand. A protective sealant can then be applied if required.